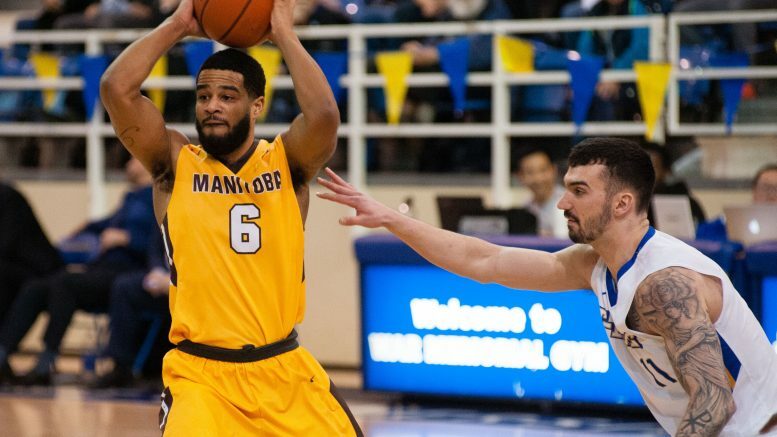 The University of Manitoba Bison men’s basketball team was swept this weekend in Vancouver by the University of British Columbia Thunderbirds in Canada West quarter final action. The Bisons lost 106-74 on Thursday night and fell 97-72 on Friday. Coming off of their Courtside victory two weekends ago, the UBC men’s basketball team brought their A-game on Thursday against the Manitoba Bisons — putting up a 106-74 score to open up the best-of-three Canada West series. For the more senior Thunderbird players, this was not only their 2018 playoff opener but a chance for a little redemption. Last season, the Bisons put a stop to the ’Birds playoff run early, defeating UBC on their home court in two games — the teams haven’t faced each other since. “I think the returning players are quite motivated to play, and I think there were some of those negative thoughts from last year carried over in the first quarter — some of the guys were a little bit tight,” UBC head coach Kevin Hanson said post-game. The T-Birds had to shake some rust off at the start of the game, having had a bye week last weekend for the start of playoffs. Entering into the first frame, the ’Birds were a step behind the Bisons, who jumped to a 5-0 lead with offence from James Wagner and Dharmjit Dhillon. However, the point gap narrowed down as the T-Birds solidified their defence. A three-pointer from veteran Conor Morgan turned the frame in the T-Birds favour, getting them to the buzzer with a four-point lead at 22-18. During the game, Morgan — as has come to be expected — took on much of the responsibility up-court for the T-Birds. Putting away 21 points for the T-Birds on the night, he put up 12 points in the first frame for the home side. In the second quarter, the extensive UBC lead allowed younger bench talent to join in on the scoring — the subs added 10 points to the home side’s tally while the starters took a well-earned break. The all-around team effort only widened the scoring gap going into half-time at 46-32. The second half saw UBC senior guard Phil Jalalpoor split his offensive work with first-year Grant Shephard, who contributed 13 out of his 17 points of the night in those closing quarters. Jalalpoor also grabbed 13 points of his 17 points in the second. For the visitors, Bisons’ forward Wagner and Cameron O’Hara kept up some momentum for the visitors, sinking three-pointers that got each of them to 16 and 18 points respectively on the night. That said, the ’Birds benefited from the depth of their bench throughout the game, as 43 points in total were contributed by the substitutes, compared to just five for Manitoba’s bench. “Our young guys on our team this year have been great. They step in and they play their hardest, and honestly, that’s one of the reasons why it’s made us one of the very good teams,” Morgan said of his teammates. Together, UBC’s roster outworked the Bisons with 50 per cent of field goals made over the visitor’s 37 per cent. Little by little, the T-Birds pushed their lead up to 81-53 by the start of the fourth and closed out the game at a dominating 106-74 scoreline. Defence was also key to UBC’s game on Thursday, as the team managed to shut down a league powerhouse in scoring. Alleyn only managed eight points for the Bisons on Thursday. Going into Friday’s rematch, Bisons head coach Kirby Schepp said his team needed to put in more effort if they hope to take down a now energized UBC team. “We need to be a little bit smarter and compete harder physically and certainly … the rebounding was the biggest story of the game…. We’ve got to hopefully do a better job of that tomorrow,” he said. It’s the quarterfinal result UBC had hoped for — just a year later than expected. With a convincing 106-74 win over the Manitoba Bisons on Thursday night, the Thunderbirds punched their ticket to the Canada West semifinals on Friday with a 97-72 win at War Memorial Gym. Redemption was sweet as the ’Birds turned the tables on their old nemesis with two straight wins — and they were nowhere near as close in score. Even so, UBC head coach Kevin Hanson said it wasn’t the easiest of wins for his team on Friday. From the get-go on Friday, the depth of UBC again played to their advantage as not only their usual scoring suspects but other starters put up big points early. Taylor Browne was the driving force in putting the Thunderbirds ahead as he sunk four three-pointers in the first and ended the quarter with 14 points in total. “I’m the type of guy, I shoot my shot. First one goes in, I’m feeling good, and these guys on my team know that I can hit consecutive threes and they always find me the ball,” Browne said of his big opening quarter. For Manitoba, Alleyn made his reappearance on the scoreboard after a fairly quiet night on Thursday — a welcomed revival for the Bisons as the rest of the team seemed less confident in shooting range. Several shots bounced off the rim of the basket, to the frustration of the visitors who still weren’t grasping the rebound game they lacked the night before. “When someone’s a leading scorer in the conference — he had eight last night — you know he’s going to come back and odds are he’s going to have a great night. We predicted it and we just kept putting different guys on him to just kind of tire him out,” Hanson said of Alleyn. Alleyn finished the night with 24 points. That said, the visitors picked up their three-point game back to their usual range as Canada West’s leading three-point team. Through the first three quarters, they were 10 for 18 outside the arc. Wagner and Rashawn Browne also upped their game after shaking out the early nerves, helping the visitors close in on the home side. On defence, Manitoba started to find their stride as they shut down the towering T-Birds forward line, crawling towards a 34-42 deficit by the end of the second. The Bisons would crumble from then on though, as T-Birds’ Shephard, Luka Zaharijevic and Anthony McNish took advantage of the rebounds beneath the basket to shatter any defensive stability the visitor’s had been fostering. The first half would end with UBC up 42-34. In the third, strong defence for the T-Birds would only continue to widen the point gap, as the lack of depth for the Bisons again started to show. With Morgan and Jalalpoor keeping the Thunderbirds organized defensively and setting them up on the break, the speed and organization of the T-Birds side started to prove too much for the visitors to compete with. “I thought we got a lot of good things from our guys that came off the bench, so I think our depth was a really big deciding factor in that game,” Hanson said. With a crowd-pleasing dunk from Shephard, the teams would finish the third with UBC up 76-63. From there, the creative play in the key for the Thunderbirds would be too hard to surmount for the Bisons in the fourth. The ’Birds ran down the clock with quick passing plays baffling the tiring Bisons defense. Going into the final minutes, the comfortable 97-72 lead for the home side gave them some room to give rookie Parker Simson alongside Patrick Simon and Izaiah Ugoalah a run out before the final buzzer. A last-ditch attempt from Manitoba’s Rashawn Browne from three-point range would just about sum up their night — the ball bounced off the rim and into the hands of UBC. With the final buzzer, the T-Birds closed out a two-game sweep in the Canada West quarterfinals with a 97-72 final score, sending them on to the semifinals next weekend while Manitoba heads home empty-handed.